Distance Education is a practical, convenient and economical way to get ahead. For many people, there is a tremendous amount of satisfaction in completing a distance learning course. Students gain competence and confidence as well as knowledge. These students know that course completion demonstrates self-discipline and favorable character traits that result in a richer, fuller life, vocationally and personally. To recognize the academic achievements of students who study at a distance, the Distance Education Accrediting Commission (DEAC) Board of Trustees in cooperation with Christopher Davis, President of the Alpha Beta Kappa National Honor Society, officially established the Delta Epsilon Tau International Honor Society (DET) on April 6, 1997. “The creation of this International Honor Society,” said Leah K. Matthews, DEAC Executive Director, “publicly demonstrates that distance study is truly a viable educational option. In addition, it serves to inspire both students and instructors in the distance study community. 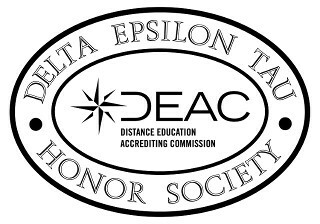 It is the "Mark of Distinction" for an institution to be awarded a Chapter of the Delta Epsilon Tau Honor Society.” Institutions must be accredited by the Distance Education Accrediting Commission before establishing a Chapter. It is the "Mark of Distinction" for an institution to be awarded a Chapter of the Delta Epsilon Tau International Honor Society.